“Her comments come as the White House’s Office of Management and Budgetis reviewing a proposal that would ease automobile efficiency standards, and people familiar with the matter have said it calls for revoking California’s unique authority to set its own limits,” reports Mark Chediak for Bloomberg News. Read the article. In its pursuit of slacking fuel economy standards, the EPA has sent a proposal to the White House Office of Management and Budget seeking to hinder California’s ability to set its own greenhouse gas emissions standards. Read the article. The White House, though, will vet the proposal, consulting with federal agencies, before unveiling the proposal in the coming weeks. The states represent 44 percent of the U.S. population, from Maine to Iowa to California. Read the article. The Trump administration was sued on Thursday for indefinitely suspending increased penalties for auto manufacturers that develop new cars and trucks that don’t meet fuel-economy standards. The Center for Biological Diversity, joined by the Natural Resources Defense Council and the Sierra Club, filed a lawsuit in the 2nd U.S. Circuit Court of Appeals on Thursday to challenge the National Highway Traffic Safety Administration’s recent decision to suspend a 2016 rule that adjusted fines to account for inflation. People tried. This article from April describes a possible deal that people hoped would keep the original fuel economy standards through 2025, by letting automakers use fat loopholes to meet those standards. In exchange, the Trump administration would commit to honoring California’s authority to set stricter standards – but only through 2030. …. White House officials were said to be pushing the E.P.A. toward a compromise with California. Some automakers who lobbied for the rollback are taken aback by Pruitt’s overboard response and the prospect of a battle with California that could throw the entire auto market into disarray. 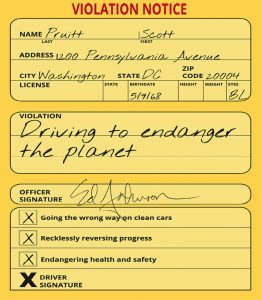 These rules are hardly an ideal climate policy, since they only apply to new cars (not the millions already on the road), and since they’ve been undercut by cheap oil and the growing popularity of SUVs. But the standard is one of the few federal programs aimed at greening the US transportation sector, which accounts for one-third of carbon dioxide emissions. These articles explain the plan and all the steps it would have to go through including EPA, NHSTA and Transportation Dept. (and that’s before they get sued). Check out the overview and a chart showing international standards and how the Obama /Ca standards are so important. Car buyers should fight Trump fuel-efficiency rollback: Those who care about slowing global warming should vote with their pocketbooks. Why roll back progress toward cleaner cars? The California Air Resources Board (CARB) weighed in. Our AG is hopping mad. How about calls and letters of support?